(CNN) -- He may not be hitting the fairways with the same bite as he did in his 1980s heyday, but the man sports commentators nicknamed "The Great White Shark" still has plenty of appetite for the game. Plenty of bite: Norman is one of golf's most successful and recognizable stars. 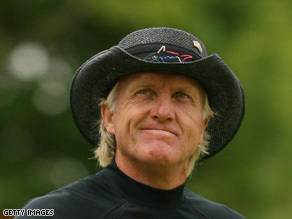 Earlier this month Greg Norman appeared in the British Open, 23 years after his debut major win. Yet while he's still driving for success on the course, off it he's taken his life in a different direction. Under his Great White Shark Enterprises company he has numerous business ventures from property, golf course design and turfing to restaurants, wine and even Australian beef. "There are very, very few athletes that do that on a global basis and to do it takes a lot of energy. You have to be on the ball, you have to be because you are the brand, you are that person walking around," he told CNN. Unlike many sports people thinking about their life after sport, he made the conscious decision that he didn't want to end up in a commentary box after his days on the links. "I think it just grew out of reality, being very much realistic in my 40s. I knew I didn't want to play golf for the rest of my life professionally. I knew physically I couldn't do it as number 1, so I had to think to the future. I wanted to know where I was going to be when I was 60," he said. Now 54, Norman took up golf at the age of 15. During his career he spent 331 weeks as the game's number 1-ranked player. Having hit the heights with two British Open titles and a total of 20 U.S. PGA wins, he also suffered his share of disappointments, losing leads and never clinching a U.S. Masters or U.S. Open. "With golf, you're going to have your ups and downs. You're going to win some, you're going to lose some," he said. And it's a reflectively mentality he's taken with him into the business world. "You have to learn by your mistakes, and in business I've made mistakes. You learn by it, and you build on those mistakes. ... By learning how to build a brand, I had to learn about business. So. ... all that tied into one, and I enjoy the process. I enjoy the idea of being the brand, living the brand." Away from being the brand, a high-profile wedding in June 2008 to retired American tennis champion Chris Evert (after both had ended long term marriages) provided headlines away from the back pages. For Norman, Evert has given his life, and even his golfing game, new impetus. "She's been a great support and a role model in a lot of ways ... She brings a lot of peace and calm and happiness around in my life, so it makes it easy for me to go out there and enjoy the things I love to do," he said. One of which is expanding his brand into new and challenging territories, including bringing more opportunities to China's growing number of golfers. "Golf is a great outlet in many ways, you know. It's got a lot of emotional qualities about it, and the Chinese are very, very strong in their mind. They're very, very strong in their belief in doing something. And I think golf completely suits their mentality and style and their physical abilities," he said.